The creation of Opportunity Zones in the U.S. is easily one of the most important economic developments of the year, with big implications for investment attraction strategies in 2019. We recognized the need for an online data tool that would help economic developers, governments and development companies put the properties in their opportunity zones front and center in a searchable format and are delighted to offer several options for presenting this data, including a brand new Opportunity Zone Viewer. Click to tweet the great news. Created in the 2017 Tax Cuts and Jobs Act, Opportunity Zones were created to direct long-term capital into low-income communities across the U.S., with tax incentives designed to attract private investment into designated census tracts through privately- or publicly-managed investment funds. The zones are urban, rural, and suburban census tracts that are either high in poverty or border high-poverty areas. The tax breaks are intended to lure funding for start-ups, housing developments and other economic activity that might not otherwise find its way in these zones. Investors in these designated areas can reduce or possibly eliminate taxes on investment gains. Governors in each state nominated Opportunity Zones for their region in early 2018. You can find Opportunity Zones in all 50 states, five territories, and Washington, D.C.
How can you showcase Opportunity Zones in your region? Easy! You get to choose how you would like this to work. We have three different options. New clients (whether economic developers, city, county or state governments, development companies, or commercial brokers) can have a dedicated Opportunity Zone viewer set up for their location, enabling viewers to research and analyze commercial and industrial properties that fall within those designated zones. You can have your Opportunity Zone viewer up and running in 30 days - start off 2019 with an interactive tool to profile these important areas. 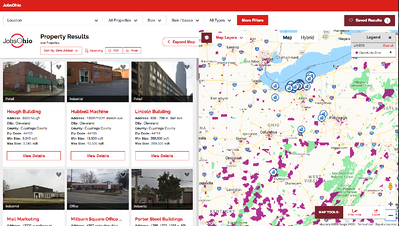 Current ZoomProspector Enterprise clients can easily add an Opportunity Zone search filter to their existing tool. The image above shows what that will look like on our redesigned ZoomProspector Enterprise application. Getting this up and running takes about 30 minutes. You can email Jeff Suneson, our client services director, to make this happen on your website. Current clients who want the Opportunity Zone Viewer as a separate, dedicated data tool can contact support have one set up for a nominal additional charge. Want to learn more? Join us Thursday, Jan. 10th at 1 p.m. EST/ 10 a.m. PST for a free 30-minute webinar exploring what you need to know to effectively showcase the federal opportunity zones in your community. Click here to register. What would work best for you? Let us help you determine the best solution for your needs. Click here to schedule a customized assessment and demo.